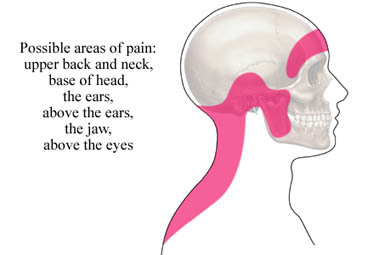 Tension-type headache. EBSCO DynaMed Plus website. Available at: https://www.dynamed.com/topics/dmp~AN~T114522/Tension-type-headache . Updated February 8, 2017. Accessed February 15, 2018. 12/16/2008 DynaMed Plus Systematic Literature Surveillance https://www.dynamed.com/topics/dmp~AN~T114522/Tension-type-headache : Jena S, Witt CM, Brinkhaus B, Wegscheider K, Willich SN. Acupuncture in patients with headache. Cephalalgia. 2008;28:969-979. 8/27/2010 DynaMed Plus Systematic Literature Surveillance https://www.dynamed.com/topics/dmp~AN~T114773/Headache : Robberstad L, Dyb G, Hagen K, Stovner LJ, Holmen TL, Zwart JA. An unfavorable lifestyle and recurrent headaches among adolescents: The HUNT Study. Neurology. 2010;75(8):712-717. 5/12/2014 DynaMed Plus Systematic Literature Surveillance https://www.dynamed.com/topics/dmp~AN~T114522/Tension-type-headache : Yancey JR, Sheridan R, et al. Chronic daily headache: diagnosis and management. Am Fam Physician. 2014 Apr 15;89(8):642-8. 2/4/2015 DynaMed Plus Systematic Literature Surveillance https://www.dynamed.com : Derry CJ, Derry S, et al. Caffeine as an analgesic adjuvant for acute pain in adults. Cochrane Database Syst Rev. 2012 Mar 14;3.